Pretotyping is a growing technique for fast innovation, faster than developing an MVP. Pretotying is about doing the hardest part first, and the hardest part is almost always getting people to change their habits and try something new. Pretotyping allows you to experiment cheaply and look for market signals that you can then build into. 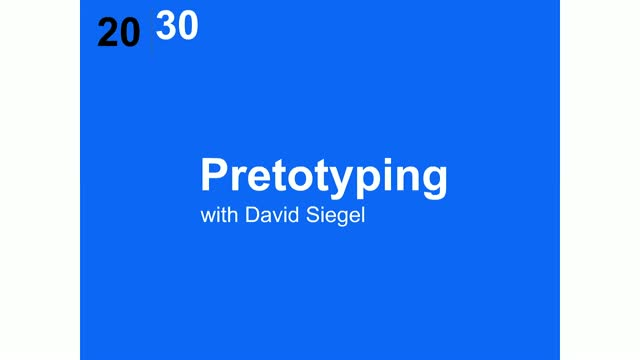 In this one-hour webinar, you'll learn what pretotyping is, the six main forms, how to iterate quickly, and much more. You'll learn why pretotyping is usually better than building a prototype or an MVP, and how several of today's successful products came out of a pretotyping experiment. Applies equally to physical and digital products and services. This is for anyone interested in fast innovation: start-ups, marketers, intrapreneurs, product managers, and more. Pretotyping is a powerful tool that should be in every innovator's toolkit. David Siegel is a Silicon Valley serial entrepreneur living in Switzerland. He played a significant role in the development of the Worldwide Web, has written five books, and coaches startups. He is now leading an open-innovation company focused on blockchain and the decentralized economy.